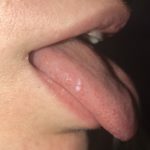 Home › Medical Questions › General › I’ve had this spot on my tongue for about a year? I’ve had this spot on my tongue for about a year? Hi. I’m 20 years old and I’ve had this place on my tongue for about a year. I first thought it was an ulcer, but never thought anything about it as I pretty much forgot it was there. It has not gotten bigger or caused me any pain. It’s just there. I don’t have any other spots on my tongue at all. I was on prednisone last year for 4 months and got off of it in July. I started hydrochoroquine for an autoimmune disease in February along the steroids. I noticed the place in March or April. I stopped the hydrochloroquine in November because of a seizure. Found out I have epilepsy and am on lamotrogine. My blood has been tested several times so I don’t think it could be cancer or something seriously wrong. I have honestly forgotten to ask my doctor about this place until now. My medical bills are through the roof and I’d rather not go to the doctor for this place on my tongue. If you could please give me an opinion on what I should do for this, I would be thankful. ← I have the flu and bronchitis to go with or some type of lung infection? Thank you. I was researching it online… Does it look similar to HPV? I’m not worried that I have it, but it does look similar in my opinion. Only surgical removal with biopsy can identify growth. From your photo, it appears to be single, smooth and irregular shaped which is not characteristic of HPV. A biopsy is best.